Rhodri challenges traditional concepts of the harp through use of preparations, micro tuning and bowed strings. He is specifically interested in working within string chamber music contexts and is a part of a young generation of European musicians who share an interest in exploring silence, texture and time. 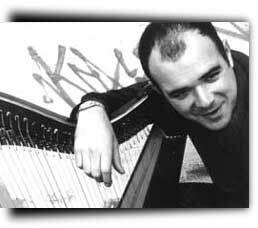 He moved to London in 1995 where he became active on the London improvisation scene. He has since performed in America, Canada and Europe and has had numerous appearances on radio and television. Co-runs the 'All Angels' venue and Confront Recordings with Mark Wastell. As well as solo playing, Rhodri works in duos with John Butcher and John Bisset. He has also performed with groups that are solely dedicated to free improvisation; Derek Bailey's Company in NY with John Zorn and Joey Baron, Strings with Evan Parker, Broken Consort, CRANC and The Sealed Knot with Burkhard Beins and Mark Wastell, a group that connects young London and Berlin musicians. Much of Rhodri's work explores the contradictory and complimentary flux between composition and improvisation, and he plays with many groups that reflect this interest, notably Chris Burn's Ensemble, IST, Apartment House and Assumed Possibilities. Rhodri has also toured England with Butch Morris' London Skyscraper. Interdisciplinary work includes 'Brush & Strings' with visual artist Marcus Heesch. In ad hoc groupings he has played with Martine Altenburger, Steve Beresford, Johan Berthling, Phillip Corner, Matt Davis, Isabellle Dutoit, Robin Hayward, Eddie Prevost, Alessandra Rombolla, Ignaz Schick, Hans Koch, Annette Krebs, Andrea Neumann, Keith Rowe and Ingar Zach.